Frederick Wiseman's At Berkeley mistakes the enemies of public higher education for its defenders. The University of California at Berkeley has long been considered the gold standard of public higher education in the US. But the university’s “public” character has come under attack in recent years. Every semester, jaws hit the floor when I tell my students how much it cost to study at Berkeley when I started there as an undergraduate in 2002. Their tuition today is roughly $14,000 a year; mine, just ten years ago, was roughly $4,000. As a result, the university has become less and less accessible to disadvantaged and under-represented students and, except for those wealthy students whose numbers have risen, the undergraduate experience at Berkeley, as elsewhere, is today shaped to a large extent by the experience of indebtedness and economic insecurity. Frederick Wiseman’s latest film At Berkeley , shot at the university in the fall of 2010, documents daily life at the university during the second year of the financial crisis. The film is motivated by an admirable commitment to advancing the ideal of a public world-class university open to students from all walks of life at a moment when that ideal is under threat as never before. But Wiseman’s message, implicit in the film and explicit its promotion, is that it is the campus administration that has mounted the defense of public higher education in California. A look at the recent history of austerity at Berkeley shows that students and workers are the ones who have made tremendous sacrifices to defend the public university, despite the violence and repression sanctioned by the very administrators At Berkeley appears to celebrate. The four-hour documentary is a celebration of the intellectual environment (and aesthetic beauty) of the Berkeley campus, showcasing star instructors teaching classes in a variety of fields to bright and engaged undergraduates. These scenes, characterized by a certain quality of timelessness, are spliced alongside scenes of administrators’ meetings on how to manage the budget crisis. The effect is to underline for the viewer how much, and what exactly, the California public stands to lose through the defunding of its universities, creating a sense of urgency through a lovingly-rendered documentation of this public good. The administration’s line has always been that students should join them in pushing for more funding from the state house in Sacramento; in lieu of higher levels of funding, however, difficult decisions would have to be made by administrators — and accepted by students and workers — on the campuses. Students and workers, on the other hand, while pressing for increased funding from the state, have always maintained that in the absence of higher levels of funding, administrators must prioritize maintaining access and equity at the university for low-income students, students of color and campus workers. Despite the budget crisis and the supposed need for austerity, the number of non-academic managerial positions, and average pay for these positions, has ballooned during the same period that low-wage workers were being fired and furloughed and tuition was skyrocketing. The statewide and campus governing bodies of the public university systems have become heavily stacked with business and finance leaders, predictably resulting in the increasingly corporatized character of these public entities. The crisis at the California universities, therefore, has been as much a crisis of administrative priorities as it has been a crisis of the state budget. And by repressing student and worker protests on the campuses, which were arguably the most effective form of pressure on legislators, administrators actually made it less likely that higher levels of funding would be forthcoming from the state. In fact, the administration has consistently played the role of enforcer of UC’s privatization through the use of police violence and legal repression. But Wiseman’s film lacks any context for understanding the dual crisis of university administration priorities and social welfare state retrenchment during the financial crisis. Without this context, the dramatic high-point of the film — a student protest directed at campus administrators — reads as little more than a misguided non-sequitur. This is an egregious oversight on Wiseman’s part, but one that should not have been difficult to anticipate — he basically embedded his film crew with the administration, producing a film that reads more like an advertisement put out by the university’s public relations department than a serious political documentary. The neoliberal response to the global economic crisis has included the privatization of public goods including education, which has propelled the development of massive, militant student movements in the UK, Chile, Puerto Rico, Quebec and California, among other places, since 2008. Privatization dispossesses students of a social good, our universities, created by and for the public at the same time that university workers are dispossessed of their livelihoods and pensions. In 2009, a year before Wiseman’s film was shot, students at the University of California, the California State University and the Community College systems faced unprecedented tuition hikes, and workers faced unprecedented attacks on their livelihoods, due to cuts in state funding and administrative refusal to reorganize budgets in order to maintain equity. In response, students across the state from California’s three-tier public university system, the largest public higher education system in the country, engaged in a series of walkouts, demonstrations, and building occupations, while unionized campus workers engaged in industrial actions. 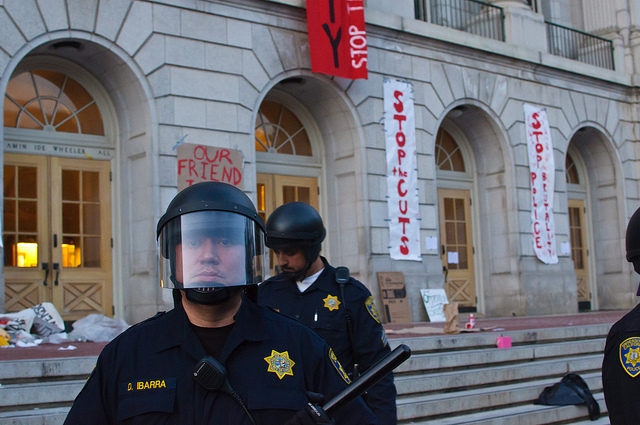 At UC Berkeley, the California public university system’s flagship campus, on November 20, 2009, in the early morning hours, dozens of students occupied and barricaded themselves inside Wheeler Hall, a beautiful neoclassical building at the center of campus that hosts more classes than any other campus building. Throughout the day, thousands of students, faculty, and campus workers massed outside Wheeler to support the students holed up inside. I was a first-semester graduate student that fall, back at Berkeley three years after undergrad, and was struck by what seemed to be a qualitative rupture in the administration’s response to student protest activities. Outside the building that day, on a campus that I had lived close to my entire life, battalions of black-clad riot police marched in columns from off-campus, shields raised, helmets down, towards Wheeler. Helicopters circled overhead throughout the day, especially after the police began to move in on the assembled crowd — erecting barriers and beating students with batons, resulting in a severed finger in one case. But the occupation and massive crowd outside lasted well into the evening and remains a major touchstone moment for the contemporary student movement at UC Berkeley, akin to the occupation of Sproul Hall during the Free Speech Movement in 1964. The key movement activists who had occupied Wheeler, however, were put through an extralegal procedure by the Birgeneau administration through the Office of Student Conduct. The process was described in a letter from 130 faculty supporters as “Kafkaesque” and reminiscent of McCarthyism. The administration’s violation of basic judicial norms even led to a complaint by the ACLU. Some of the most visible leaders from the student movement waited in limbo as the process stretched on for months and into the following school year, not knowing whether they would be allowed to remain in school. When punishments were officially handed down, many students were required to submit what amounted to recantations of their political beliefs, exposing the political nature of the prosecutions. Student activists developed an analysis of the role of austerity at the university and its effects on public education and the workforce. In the short-term, austerity allows states to make up budget shortfalls during periods of crisis on the backs of students and workers. But students also came to recognize that in the long-term, university privatization was a means for capital to extract ever-greater surplus in the form of debt borrowed against their future wages, and an encouragement for a small number of individuals to profit from the inevitable transfer of students from the public education system to for-profit universities. Furthermore, students argued that debt-fueled education is an effective way to discipline the future labor force, particularly in an economic context in which jobs are scarce and a college education is no longer a guarantee of anything. Instead, debt-fueled education is simply part of a wider social process of dismantling the welfare state and shifting an ever-greater burden of the cost of training and maintaining the workforce from employers and the state onto workers themselves. The fight against the privatization of public education means that university student struggles today have taken on a qualitatively different character than in the past, when students fought primarily for external political issues. Today’s university student struggles are class struggles. For this reason, students and workers at public universities today have begun to make common cause together as never before. Unfortunately, any understanding of the analysis developed by student activists, and the strong ties that have been built between the student movement and university labor unions, is entirely absent from Wiseman’s film. While the student movement at Berkeley, with some notable exceptions, struggled to build on the 2009 mobilization the following year after administration repression, the resonance of anti-tuition hike struggles in California in 2011 with the national Occupy movement led to an explosion of protest activities throughout the state university system that fall. Berkeley was no exception. What began as a decently-attended protest on November 9 ballooned into a major standoff with off-campus police called in to respond to the erection of tents on the grassy knoll adjacent to the “Mario Savio Steps” on historic Sproul Plaza. Hundreds of students linked arms to nonviolently prevent the tents from being taken down by external riot police and withstood police brutality in return. In one widely-circulated video, a female student and faculty member are seen being grabbed by their hair and thrown to the ground while nearby students scream in pain as they are jabbed in the abdomen with batons. Berkeley Professor and former US Poet Laureate Robert Hass and his wife and fellow faculty member Professor Brenda Hillman also suffered police violence as they stood with students. Graduate student organizers sustained broken ribs, sprained wrists, and badly bruised torsos; some have reported longer-lasting psychological trauma. The decision of the administration to call in off-campus police authorized to use force to take the tents down met with nearly universal condemnation on campus and in the media, leading to eventual apologies from administrators. While the administration initially tried to insulate the Chancellor, who had been in Asia that day, from criticism, a FOIA request revealed that he had been in close contact with administrators throughout the day and shared in the blame for the decision to deploy police force. Students and community members responded with a series of day-time actions and a massive night-time protest the following week, one of the largest protests ever to be held on Sproul Plaza. The next day, students and supporters from across Northern California joined together in San Francisco for a rolling occupation of the Financial District, culminating in the occupation of a Bank of America branch with nearly one hundred arrests. Rather than quelling student dissent this time around, the administration’s miscalculated over-reaction to the protests had galvanized a much broader swath of the campus community to join the fight against austerity at the university. Even the normally careful Faculty Senate joined in, censuring the Chancellor in a meeting held in an auditorium with overflow capacity due to the widespread outrage the police response had generated. Birgeneau would announce his resignation just months later. While Birgeneau and other administrators sounded particularly tone-deaf in 2010 given the national outcry over the response to the Occupy Cal protest the following fall, they, unlike Wiseman in his editing room, couldn’t know what the next year would bring. Wiseman’s decision to maintain the sympathetic portrayal of the university administration despite the following years’ developments is an abrogation of his commitment to responsible film-making. The fact that the university’s current administration is heavily promoting the film on campus, while former Chancellor Birgeneau and Executive Vice Chancellor George Breslauer have been doing promotional events with the filmmaker, is the best indication that something is amiss. Student activists and campus workers had thought that Breslauer and Birgeneau had been thoroughly discredited after Occupy Cal; At Berkeley indicates we’d thought wrong. The film, which could have been an opportunity to show resistance to privatization from the perspective of those of us who literally have been putting our bodies on the line, sometimes at great risk to our health and careers, is instead a paean to a disgraced former leader, Robert Birgeneau. Tellingly, Wiseman also chose to render blue-collar campus workers in the film as little more than part of the scenery. Workers are seen sweeping stairways and mowing the lawn, but never once given the opportunity to voice their views on layoffs, furloughs, erosion of working conditions, and attacks on their pensions. Instead, we see the Chancellor making a glib joke at the expense of the one gardener left on staff to attend to the entire campus, while other administrators treat worker opposition to the campus austerity program (like the “Operational Excellence” program, drafted by Mitt Romney’s Bain and Co. to the tune of $7.5 million) as essentially irrational resistance to change. Though we have nearly wall-to-wall union organization at the University of California, Wiseman never bothered to venture into a union meeting. We see the Chancellor talking about shared sacrifice, but never once does the viewer learn that top administrators were the only group of employees in the UC system who not only did not take pay cuts or furloughs during the crisis, but continued to receive annual raises and enormous annual bonuses. The irony of one of the highest paid public servants in the state appearing to express sympathy for low-wage campus workers suffering from decisions Birgeneau himself had made was apparently lost on Wiseman. More striking still, given the significant national publicity that the student movement in California had already received by the fall of 2010, when Wiseman shot the film, he didn’t include meetings of student groups actively organizing in the student movement, resulting in no more than twenty minutes of student protest footage in a four hour film about the university in crisis. As a consequence, when we hear from students, it is almost entirely mediated through interlocutors from the faculty and administration (though a scene in which a crying student meets with financial aid officers who push her to take on greater debt as her family struggles economically is certainly telling). While Wiseman includes a few minutes of powerful speeches in Sproul Plaza, the scenes have been carefully culled to minimize the appearance of student criticism of the university administration, instead simply echoing the administration’s line of blaming everything on the unwillingness of the dysfunctional state legislature in Sacramento to re-fund public education. The balance sheet of what the California student movement has accomplished is significant. Just months after the fall, 2009 protest wave, Gov. Schwarzenegger’s office announced that the state would be restoring hundreds of millions of dollars of funding to the public universities, specifically citing the student protests as the tipping point for the decision. Then, due to the massive protests statewide in the fall of 2011, UC students forced an 80 percent fee increase over the next four years off the table. Our tuition has effectively been frozen at the 2011 rate, despite increases almost every year for the previous ten years. And in 2012, Californians voted by a significant margin to raise taxes to restore significant amounts of funding to the public education system. Viewers unaware of these victories will unfortunately be none the wiser after viewing the film. Today, the struggle against austerity at the university continues in full force, and it is students and workers, not administrators, who are on the frontlines. Graduate student reformers active in the student movement in 2009 took over our statewide union, UAW 2865-UC Student Workers Union, in 2011, running on a platform of building stronger ties between students and workers to more effectively fight privatization On November 20 (four years to the day of the Wheeler occupation), our union, representing 13,000 student workers at campuses across the state, engaged in a solidarity strike with AFSCME 3299’s 20,000 service workers at the university. The university administration has responded predictably. The strike itself was called in response to heavy-handed intimidation of AFSCME workers by the administration in the spring. When UAW 2865 announced that it would strike in sympathy, administrators and university officials sent out emails suggesting that graduate students did not have a legal right to strike; that they could lose pay, be forced to pay tuition or be fired and replaced for striking; and, most egregiously, suggesting that international students could lose their US visas if they participated in the strike. In the aftermath, administrators on some of the campuses have also begun to target undergraduate supporters of UC workers. Major challenges remain throughout the public education system. The K-12 and Community College systems continues to be woefully underfunded, and tuition at the CSU and UC systems is still at a record-high level, even adjusting for inflation, pricing out more and more students from the public university system. And there are signs that tuition increases may be back on the table after the next school year. Workers in the education system also continue to suffer from wage freezes and attacks on their livelihoods. Furthermore, it is the precedent set by Birgeneau at the Berkeley campus that allowed our new Chancellor, Nicholas Dirks, to state openly in a summer interview with the alumni magazine that he believes he was hired because he was perceived as “battle-ready” by the Regents. And the selection of deportation czar and former head of Homeland Security Janet Napolitano as the new president of the University of California is perhaps most indicative of the nexus of violence, legal repression and privatization that defines the current political landscape at the public university. It is this nexus — summed up by the student movement slogan “behind every fee increase, a line of riot cops” — that is so noticeably absent from Wiseman’s film. Though he was driven to make the documentary by an admirable desire to defend the mission of public higher education, by omitting the troubling role of the campus administration in consistently relying on the use of force and repression to drive through austerity measures, he has fundamentally distorted the picture. Instead, At Berkeley is a missed opportunity, projecting a vision of the university from the perspective of those with power who have not suffered during the crisis. It is a mistaken vision of change from above, blind to the fact that the defense of the vision of public higher education that Wiseman claims to care so much about has come, at Berkeley and elsewhere, from below. Frederick Wiseman’s At Berkeley mistakes the enemies of public higher education for its defenders.